A Thyroid Cancer Awareness Blog sponsored by Stevie JoEllie's Cancer Care Fund. Both diabetes and thyroid disorders involve a dysfunction of the endocrine system, which is a group of glands that help regulate various aspects of the body's metabolism and essential biological functions. Diabetes is a disorder characterized by an overabundance of glucose (sugar) in the blood due to insufficient insulin production by the pancreas (type 1 diabetes) or the inability of the body to utilize insulin to transport glucose into the cells (type 2 diabetes). Clinical research has found that diabetes and thyroid disease then to co-occur in patients. Almost one third of people with type 1 diabetes have been found to have thyroid disease. This is because type 1 diabetes and the most common thyroid disorders are autoimmune diseases, which are diseases in which the your immune system attacks a gland(s) or organ(s) of the body as it would an infection. People with autoimmune disease are more likely than the general population to develop other autoimmune diseases such as Addison Disease, Grave's Disease, Hashimoto's Thyroiditis Pernicious Anemia, Rheumatoid Arthritis or Lupus and so on. Thyroid disorders are more common in type 2 diabetes patients because both these illnesses tend to occur more frequently as people age. The thyroid is a butterfly shape gland at the base of the neck that lies across the trachea most commonly referred to as "the windpide". It produces and releases thyroid hormones. Thyroid hormones affect every cell of the body and controls many essential body functions. The amount of thyroid hormone made by the thyroid gland is regulated by the pituitary gland and the hypothalamus in the brain. The pituitary gland releases thyroid stimulating hormone (TSH) which signals the thyroid to produce more thyroid hormone. When the pituitary gland senses that there is a right amount of thyroid hormones in the body, it then decreases thyroid hormone production. 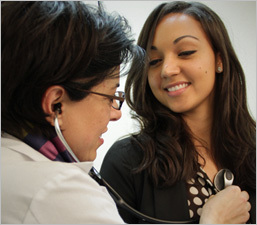 Your doctor measures the health of your thyroid gland by measuring thyroid stimulating hormone levels. Too little thyroid hormone production causes a condition known as hypothyroidism. Too much thyroid hormone production causes a condition knows as hyperthyroidism. When a patient has hypothyroidism, he or she may feel tired and cold most or all of the time, have a slow heartbeat, or feel depressed. Mild thyroid failure is a mild form of hypothyroidism. In patients who have mild thyroid failure, the thyroid hormone levels are "normal", but the TSH LEVEL IS ELEVATED. Patients with mild thyroid failure often don't show any obvious symptoms, but untreated mild thyroid failure may lead to hypothyroidism. Patients with hyperthyroidism may feel jittery and may experience nervousness, a rapid heartbeat or unexplained weight loss. Patients with mild mild hyperthyroidism have "normal" thyroid hormone levels, but the TSH LEVEL IS DECREASED. Untreated mild hyperthyroidism can progress to hyperthyroidism and may lead to potentially serious life threatening consequences such as cardiovascular disorders. Thyroid disorders can have a major impact on glucose control, and untreated thyroid disorders can affect how diabetes is managed. Hypothyroidism can decrease the insulin requirements in patients with diabetes. Symptoms of hypothyroidism are common patients with type 2 diabetes. Hyperthyroidism may worsen glucose tolerance or control. Symptoms of hyperthyroidism may be attributed to poor diabetic control in patients with type 1 diabetes. Underlying thyroid disorders may go undiagnosed because the common signs and symptoms of thyroid disorders are similar to diabetes and can be overlooked and/or attributed to other medical disorders. Because of the link between diabetes and thyroid disease, the American Diabetes Association has recommended that people with diabetes be tested for thyroid disorders. The TSH test, which measures the amount of thyroid stimulating hormone being produced in the body, is the best test for thyroid function. A TSH test will give your doctor knowledge regarding the extent of thyroid function. An elevated TSH Level may indicate hypothyroidism. A low TSH level may indicate hyperthyroidism. Treatment will continue for the rest of a patient's life, with the doctor checking TSH levels every six months after the patient is stable and the correct dose is achieved for them. Hypothyroidism may decrease the insulin requirement in patients with diabetes, therefore, a diabetic patient with hypothyroidism may need his/her diabetes medication dose adjusted. Patients on hormone replacement therapy should not switch medication brands without checking with their doctors. Symptoms of fatigue, weight gain, cold hands or feet, hair loss, depression or any other new or unusual symptom should be reported to your doctor as they may indicate your thyroid hormone replacement dose needs to be changed or adjusted. Hypothyroid patients should never, ever, stop a thyroid hormone replacement therapy without taking to their doctor. Extremely low thyroid hormone levels can lead to coma and even death. Take antithyroid drugs, which will slow down the thyroid's hormone production. Radioactive iodine therapy, which will destroy thyroid cells in order to reduce the amount of thyroid hormone produce. Finally, if all else fails or you are concerned and opposed to radioactive iodine therapy, surgical removal of the thyroid gland may be recommended. Hyperthyroidism has been known to affect control of the amount of glucose in the blood, therefore, treatment for hyperthyroidism should help control blood glucose levels but following treatment for hyperthyroidism many patients may develop hypothyroidism. MORE INFORMATION: Patients who have further questions should contact their doctor. The Thyroid Cancer Coffee Break welcomes Leslie Ward Umfleet Founder of Random Acts of Purpose a 501(c) 3 Public Charity whose mission is to provide families with the everyday things they need while dealing with cancer. Leslie is also the mother of a 12 year old boy who is a Pediatric Thyroid Cancer Survivor and she will share with us her journey as a "Thyroid Cancer Mom" and some great information about her nonprofit organization based in Tulsa Oklahoma. Thyroid Nodules, Thyroid Lumps & The Thyroid Enlargement Known as a Goiter. 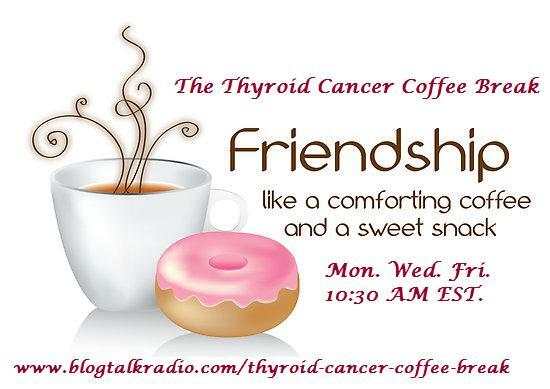 Our Thyroid Cancer Coffee Break (c) All Rights Reserved. Watermark theme. Powered by Blogger.